When you’re thinking about an US East Coast vacation, your mind automatically goes to New York. Or maybe you think of the sun and beaches of Florida for inspiration. 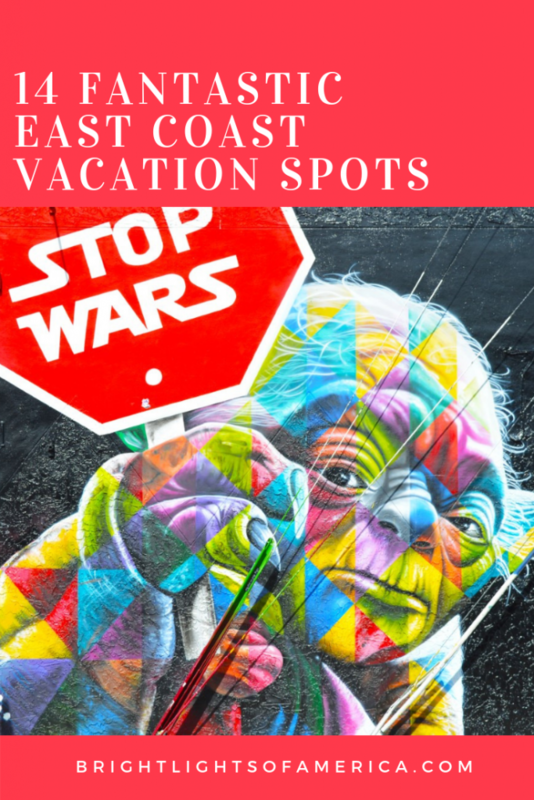 But there are so many other great holiday destinations up and down the US East Coast that deserve your attention. From beautiful state parks bursting with waterfalls, to cities brimming with history and your pick of piers and harbours. If you’re looking for an East Coast vacation for the family, St. Augustine is a great choice. Picture: DQ Travel. 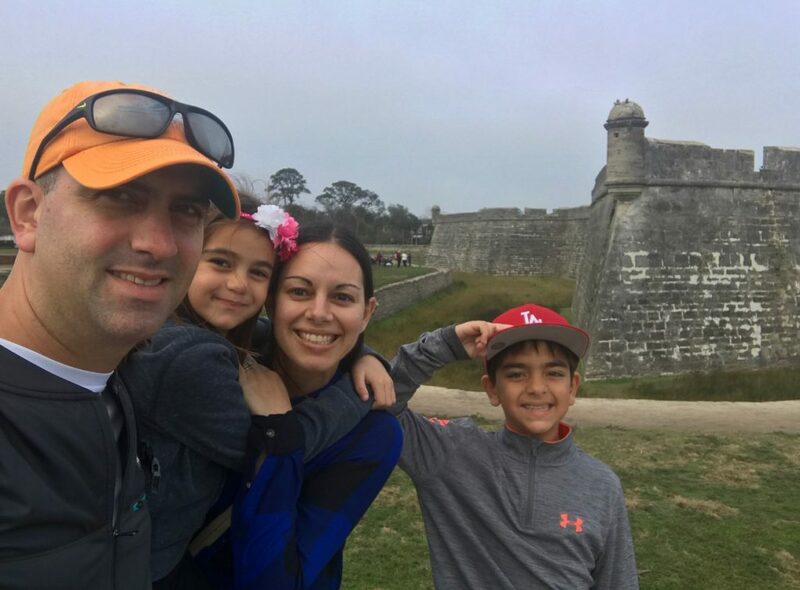 Written by Margie, who has travelled to St. Augustine with her family – you can read all about it here. You can also follow her on Facebook. St. Augustine is one of my favorite cities to visit on the East Coast. Located in northern Florida, St. Augustine is a unique place to explore filled with history and culture. It is considered the oldest city in the United States, founded in 1565, and is filled with colonial Spanish architecture everywhere you turn. The streets are lined with cobblestone and just walking through the quaint downtown sends you back in time. 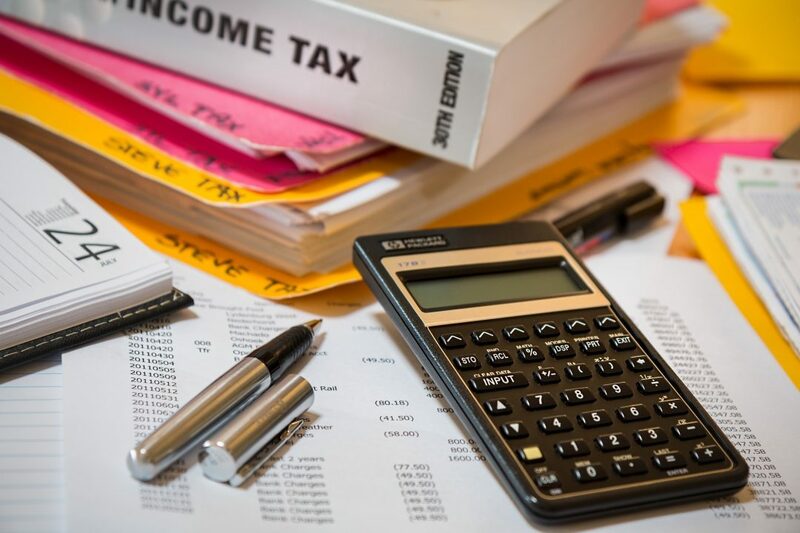 Around downtown, you will find Castillo San Marcos (the oldest masonry fort in the country), the oldest wooden schoolhouse, the Pirate and Treasure Museum and the Fountain of Youth Archaeological Park. It is a great place to bring your family, yet also a romantic destination for a couple. Bed and breakfasts sprawl throughout the city, and the restaurants have a blend of Spanish, Caribbean, and Southern cuisine. The city mixes colonial style with old world Florida. Situated right by the water, St. Augustine is a beautiful place for a stroll. I highly recommend a visit to St. Augustine for a one of a kind experience, it’s a great spot for an East Coast vacation. The opulent Breakers Mansion in Newport, Rhode Island. Picture: Cosmopoliclan. 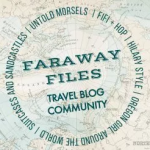 Written by Sarah, who travels with her family and blogs about their adventures at Cosmopoliclan. You can also follow her on Twitter. Tucked away between Connecticut, Massachusetts and the Atlantic Ocean, the smallest US state of Rhode Island is home to a little gem. The increasingly popular summer resort of Newport is located on the south end of Aquidneck Island in Narragansett Bay. It’s a very bike-friendly place, with scenic pathways along the ocean and plenty of nice eateries and coastal boutiques to discover. The city’s history is tied to the sea and that aspect is still very much alive, making Newport the place to be for a slice of seafood heaven. Most tourists, however, visit the city for that other historic identity. 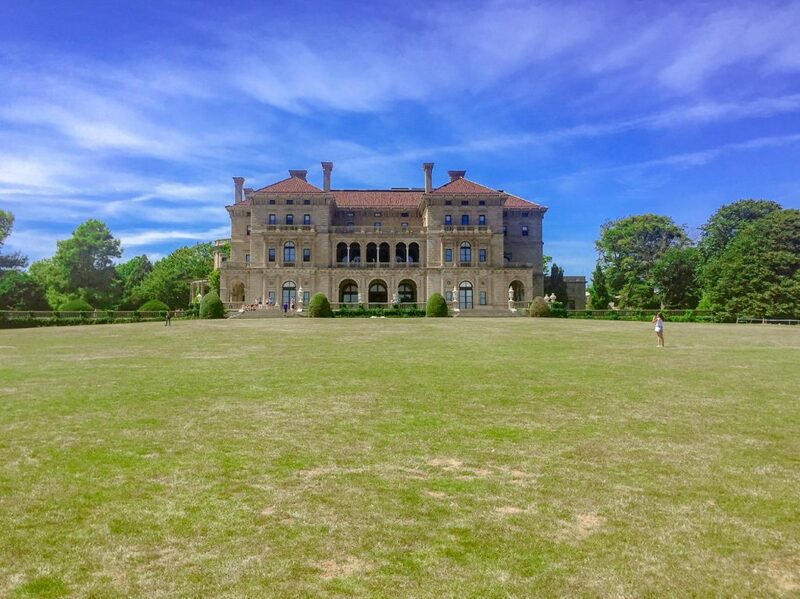 The opulent, seaside mansions from the Gilded Age, such as Rosecliff Mansion and The Breakers, are well worth a visit. Their enviable location guarantees striking vistas, to be explored from the manicured gardens or from the Newport Cliff Walk. The ever-energizing sea breeze leads you on a 3.5-mile-long walk along this designated National Recreation Trail where the pathways, some paved and others quite rocky, hug the Newport cliffside. The few from along the Cascade Mountain Hike in the Adirondack Mountains. Picture: Wanderlust While Working. 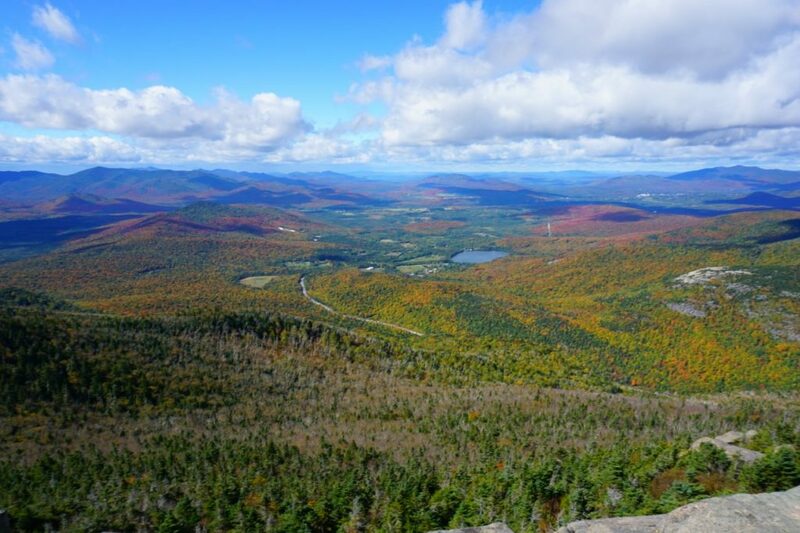 Written by Danielle, who adventures on her days off and loves the Adirondack Mountains – you can read her comprehensive post about the mountains here. You can also follow her on Instagram. Since I moved to Upstate New York two years ago, one of my favorite pastimes has been spending time in the Adirondack Mountains. If you’re an outdoor enthusiast, the Adirondacks are your playground for all things hiking, boating, camping and even skiing in the winter! If you’re really aiming to get lost in nature, this is a great place to do it because half the time you aren’t likely to have cell service and the other half of the time you’ll be too busy taking in some of the views from a mountaintop or even just from the highway on your drive through. Even if you aren’t a fan of the outdoors, there is outlet shopping, a small amusement park, and plenty of brewery and dining options to check out. Written by Dorothy, who is such a big fan of the East Coast that she’s also written a great itinerary for Mt Washington, Baltimore. You can also follow her on Facebook. 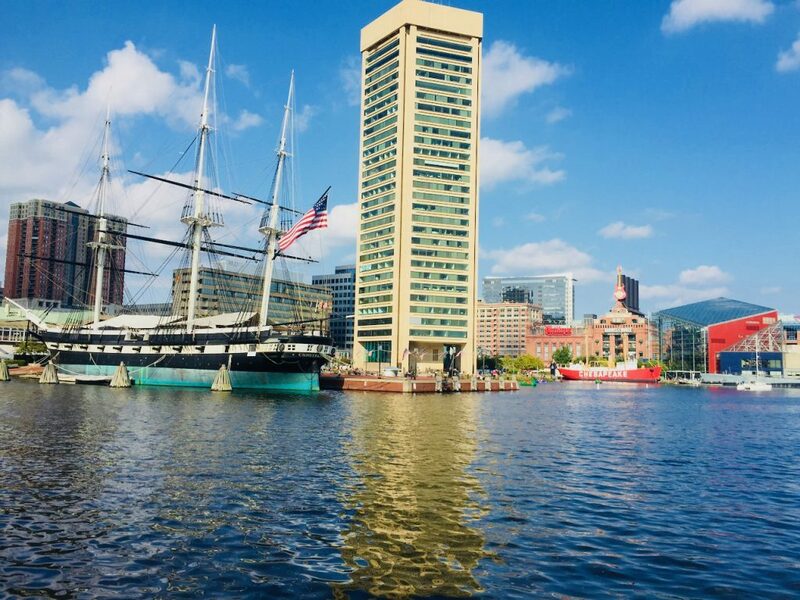 First-time Baltimore visitors should explore the National Aquarium and Maryland Science Center in Inner Harbor, plus Fort McHenry. But to get a local feel, visit the neighborhood shops, bars, and restaurants, and dine on Chesapeake Bay seafood. locals to shop and schmooze. Previously frequented by pirates and prostitutes, take a ghost tour in one of Baltimore’s oldest neighborhoods, Fells Point and grab a drink at the historic “The Horse You Came in On” bar. Look for trendy shops, restaurants, and bars on West 36th Street in Hampden. Stop in Cafe Hon for a Maryland crab cake and see real “Baltimore Hons.” For the artsy, grab some wine and join your friends at “The Painted Palette” in Mt. Washington, for a painting party, or build with clay at Baltimore Clayworks. Afterward, check out the hip shops and restaurants. For upscale dining and shopping visit Harbor East. In summary, if you wander through some of these neighborhoods, you can experience Baltimore like a resident. 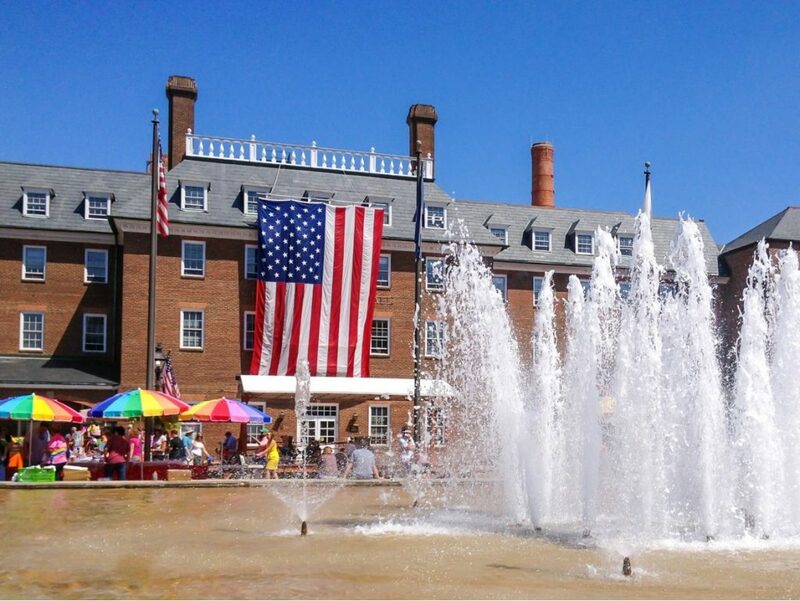 There are plenty of reasons to put Alexandria, Virginia on your East Coast vacation list. Not least, the area’s Old Town. Picture: MB Sees. Written by Mary Beth, who is a woman after my own heart – she like seeing new places, stuffing her face and not acting her age. Read more from her at MB Sees. You can also follow her on Twitter. Alexandria, Virginia is just a few miles outside of the nation’s capital, and a great add-on to any Washington, DC, visit. 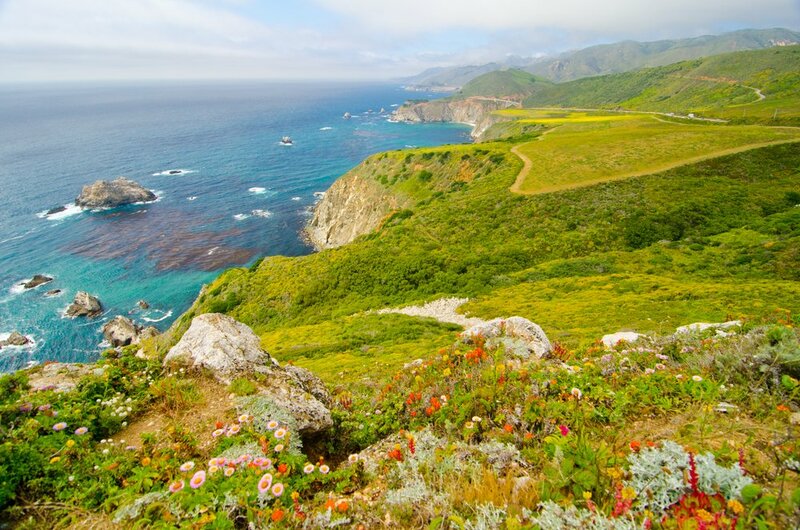 But it’s also a destination in its own right and perfect for an East Coast vacation. The Old Town area is filled with history and sits on a beautiful waterfront with views of DC across the Potomac River. You can drink in a tavern where George Washington drank, walk down cobblestone streets from the 1700s, and view historic row houses with their original gas lamps still aglow… all while shopping at trendy boutiques and dining at upscale restaurants. A ten-minute drive down the street will take you to George Washington’s Mount Vernon estate, where he lived when he wasn’t off fighting various wars or in the White House. The estate and grounds have been beautifully preserved and is a great stop for history-lovers. Local tip: if you visit Alexandria, be sure to check out the narrowest house in the country just a couple blocks off King Street, and visit America’s oldest farmers market in the courthouse square! Written by Mary Beth, who has a comprehensive post on the Outer Banks here. 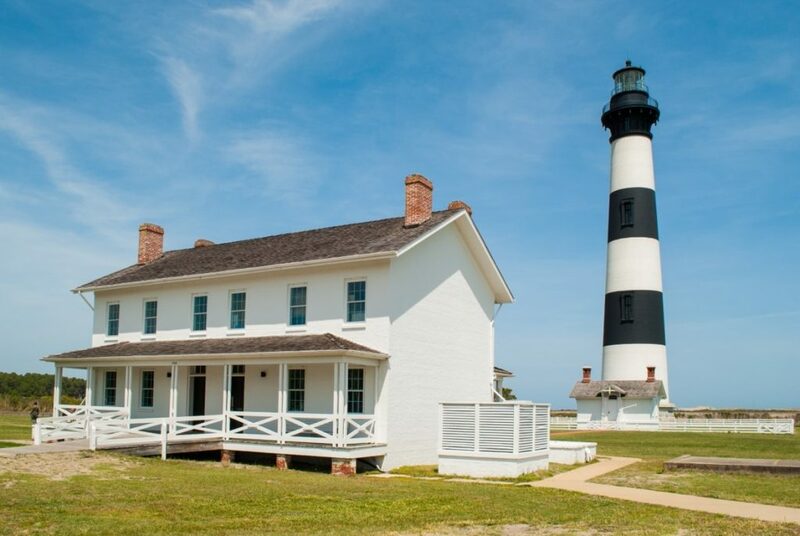 North Carolina’s Outer banks are a must-see for folks wanting a laid back beach experience. These barrier islands are known for their historic lighthouses, natural dunes and abundant wildlife – including wild horses! The town of Kill Devil Hills is especially famous for being the “birthplace of flight,” and the National Park Service has erected a national monument at the site of the Wright Brother’s first successful flight. If you’re looking for a beach party scene, this isn’t it. But if you want a quiet escape with uncrowded beaches, small family-owned eateries and salty local anglers, the Outer Banks is where it’s at. Our family loves playing in the sand, doing some surf fishing, visiting the historic sites and watching hang gliders soar over the dunes. If that’s your jam, you’ll love it, too! 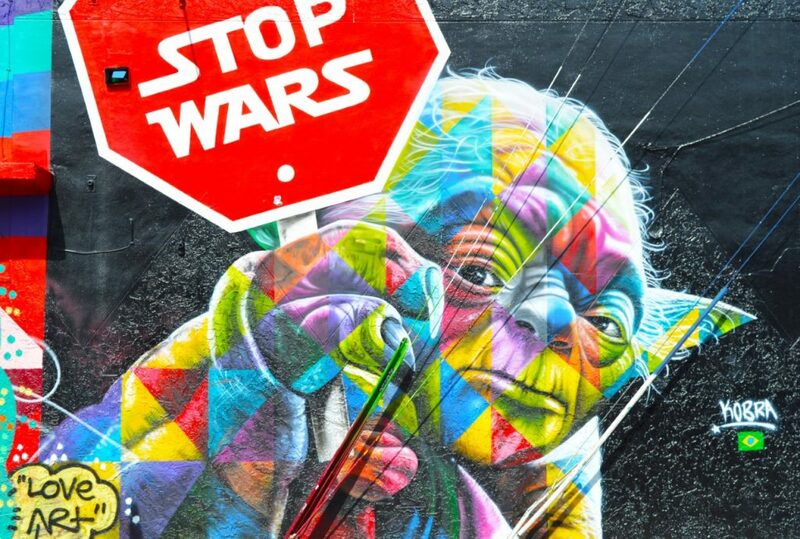 Artist Eduardo Kobra turned Yoda into a peace activist at Wynward Walls. Picture: Stop, Drop, and Trek. Written by Katelyn, who writes at Stop, Drop, and Trek, presumably when she’s not out on a trek herself. You can also follow her on Instagram. Oh, Miami. You will always have my heart with your palm trees, salty air and vibrant culture. One of my musts for Miami goers is a visit to Wynwood Walls. This is a free graffiti art exhibit in an old warehouse district. The murals vary in size, style, and content, but every last one is absolutely stunning. Definitely make sure to wander around after your visit, as there are murals lining the streets outside of the actual exhibit that you don’t want to miss, including my favorite pictured here. Good news is after you’ve walked up an appetite, you’ve got plenty of scrumptious places to eat. Wynwood District really is a foodie’s haven with GKB R House, Alter, and Wynwood Kitchen all serving up delicious eats. Then, after your meal you can check out Zak the Baker for a sweet treat. Miami is busting with life spanning across the city, and while there is so much to do in this wonderful city, definitely don’t miss Wynwood District! The sunset at Cape Cod Canal in Sandwich is glorious. Picture: Transformed Thru Travel. Written by Brittany, who inspires other travellers over at Transformed Thru Travel. You can also follow her on Facebook. Cape Cod is unlike any other place on the east coast. It’s everything you imagine – quaint villages, sandy beaches, and seafood – but there’s so much more. There’s this electricity in the air that I can feel but not explain. It’s kinda like magic. It starts in the spring when seasonal restaurants and shops start opening. It gets stronger as visitors come to play on the beaches during long weekends. It reaches a high on the 4th of July when everyone is celebrating and barbecuing, everything decorated in red, white, and blue. The feeling continues through August. The magic is in the smell of fresh waffle cones and music from a carousel drifting through the air. You can feel it while watching visitors take selfies in front of lighthouses. While watching the most beautiful sunset of your life, night after night. The magic doesn’t stop on Labor Day, the official end of summer. I can still feel it as the leaves change color and on rides through cranberry bogs along the bike path. When I see a gang of wild turkeys saunter through my yard. I feel the magic in everything. Come to Cape Cod and feel the magic for yourself. Once a city that was avoided, Pittsburgh now has some eco-credentials and is ready for visitors. Picture: Everywhere Forward. Written by Kathrine and Pam, who have a fantastic guide to Pittsburgh right here. You can also follow them on Instagram. Pittsburgh, Pennsylvania is an exciting, up-and-coming city for both locals and tourists alike! Fifty years ago, no one would have wanted to visit Pittsburgh because of the pollution from the steel industry. But today it’s a revitalized, eco-friendly city full of diverse activities and unique food, surrounded by a community of kind and welcoming locals. We love Pittsburgh because there is always something new to explore! 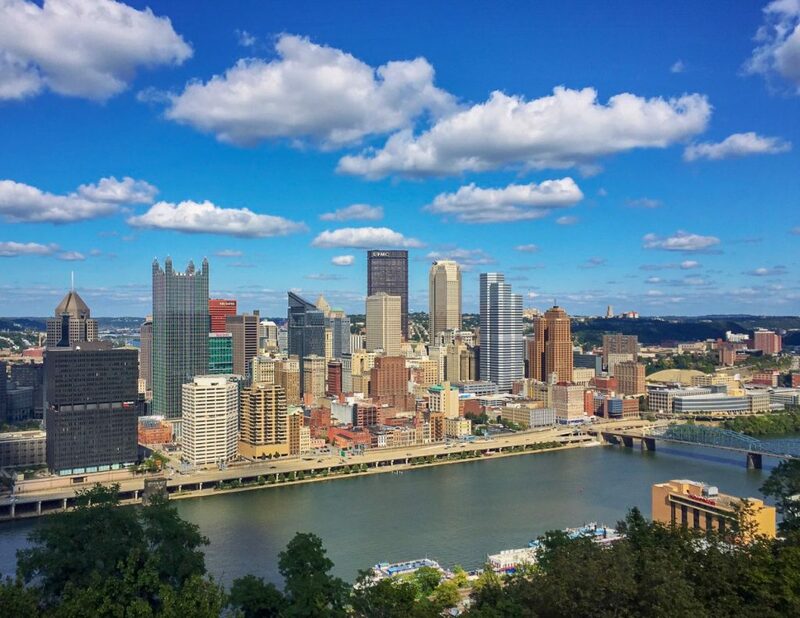 Some of our favorite activities in Pittsburgh include for world-class museums such as the Carnegie Museum of Natural History, the National Aviary, sporting events, and dining in the Strip District. Our favorite part about Pittsburgh is its scenic views. With hundreds of bridges crossing the three rivers cradling downtown Pittsburgh, the city is beautiful to photograph, especially from the Mount Washington Overlook. During the summers, walking along the Three Rivers Trail is a local’s favorite pastime. If you’re looking for somewhere new and fun to visit on an East Coast vacation, consider visiting Pittsburgh! 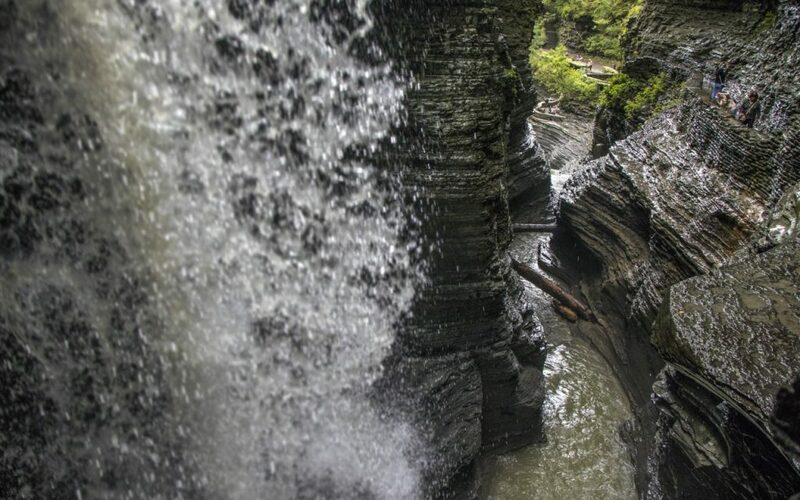 Cavern Cascade is just one of the 19 waterfalls within Watkins Glen State Park. Picture: I’ve Been Bit. Written by Lindsay, who has a comprehensive guide to Watkins Glen here. You can also follow her on Twitter. The Big Apple may be the first thing that comes to mind when you think of New York state, but that’ll change once you visit Watkins Glen! While the town itself is quaint and adorable, Watkins Glen State Park is the true gem of the area. Here you’ll find 19 beautiful waterfalls, carved out thousands of years ago by glaciers in the Seneca Valley. Tackling one of the three trails within this 778-acre park makes the perfect afternoon activity! I highly recommend the Gorge Trail which will take you to all of the 19 beauties, including Rainbow Falls. If you’re looking to enjoy the park with less people, it’s better to arrive early before the influx of tourists and buses arrive. Afterwards, you can enjoy a delicious ice cream cone just down the road at the Great Escape Ice Cream Parlor. Whether you have a whole day to explore or just a few hours, Watkins Glen is not to be missed when visiting the Finger Lakes area of New York. How could you pass up an East Coast vacation to New York? Picture: Trimm Travels. 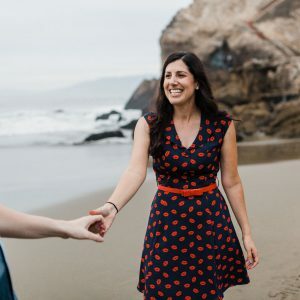 Written by Heather, who blogs about her travel experiences over at Trimm Travels. You can also follow her on Instagram. New York City is arguably one of the best places to visit on the East Coast and quite possibly the most popular city foreigners want to see when visiting the United States. Having been to NYC many times, I totally understand why. There is literally anything and everything you could possibly want to do happening in New York City. 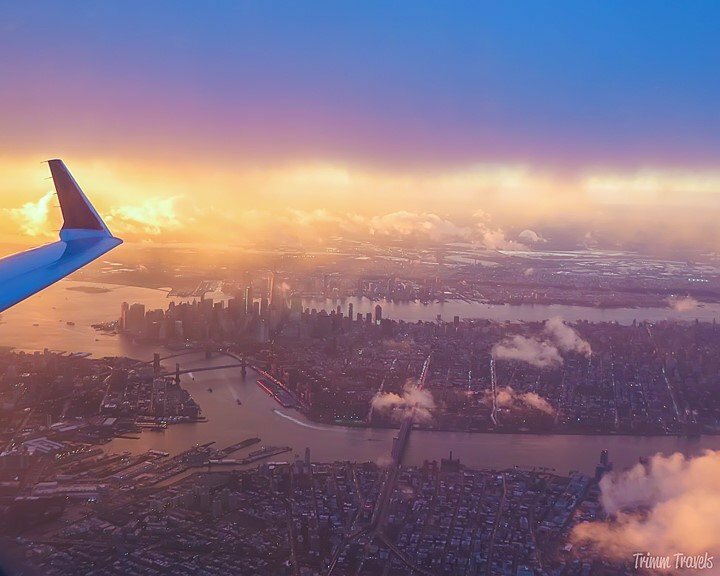 From the Empire State Building to Freedom Tower, enjoy beautiful views of the city. See a Broadway musical or visit one of the many art or history museums. Stroll through Central Park, go on a fabulous food tour and hit up some of the most amazing shopping the world has to offer. Whatever you choose to do, you can’t go wrong. NYC truly is one of my most favorite cities in the entire world to visit and definitely my number one choice on the East Coast! If you’re looking for a small town feel in a big city, you need to visit Richmond, Virginia. Picture: Countdown to Friday. Written by Kristin, who also has a great review of a historic hotel in Richmond. You can also follow her on Facebook. I can firmly say that Richmond is one of the most underrated cities in America, let alone the East Coast. As a center for history, foodies, and nature lovers, there’s something for everyone. Did you know that Patrick Henry gave his famous “Give Me Liberty or Give Me Death” speech in Richmond? Or that Edgar Allen Poe grew up here? That it was ranked on National Geographic’s list of 10 places in the world to travel for food in 2016? 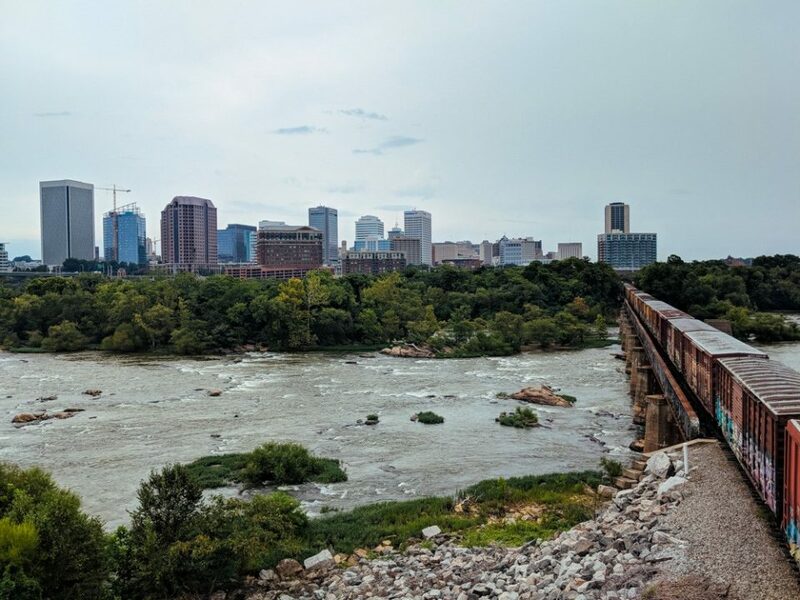 Or how about the James River Park System, which runs through Richmond, has the only urban class III and IV rapids in the US for rafting and kayaking? Yeah, that’s all pretty impressive. Richmond is big city with a small town feel and a lot of culture. Walking through the various neighborhoods you’ll see funky murals, local shops, and a bustling craft brewery and cidery scene, It’s the kind of place where you can find world class museums, like the Virginia Museum of Fine Arts, and the hole in the wall restaurants with authentic Japanese noodles. So visit RVA (the affectionate abbreviation for Richmond, Virginia) and enjoy all it has to offer. 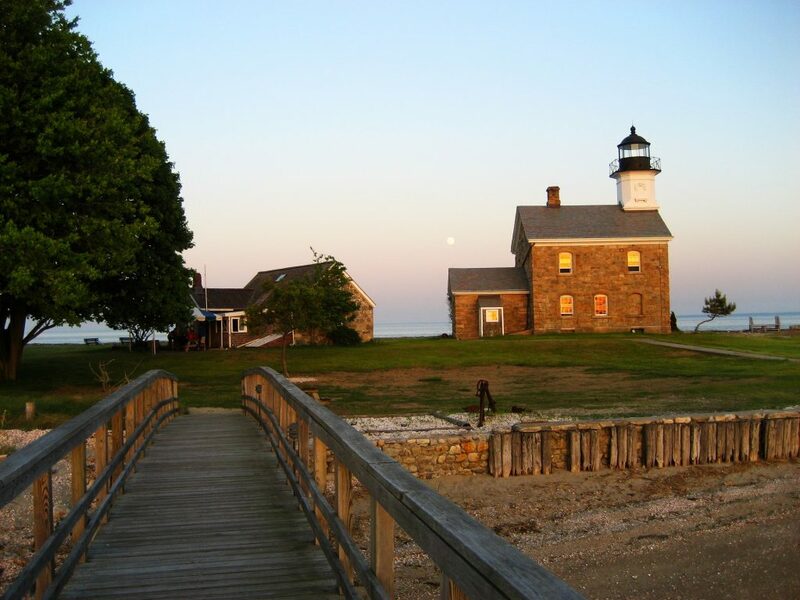 While you’re in Mystic, why not sneak over to nearby Norwalk, to see the Sheffield Island Lighthouse. Picture: Girl With The Passport. Written by Kelly, who seems to always be travelling to somewhere amazing and documenting it at Girl With The Passport. You can also follow her on Twitter. 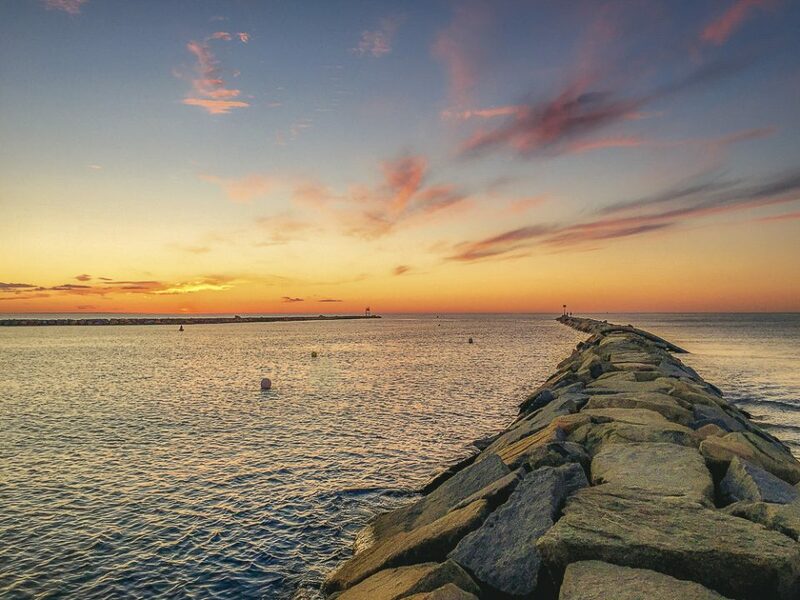 Hidden away along the rustic Connecticut coast lies the quintessential seaside town of Mystic. It’s not a big town, but a sleepy, seaside village that feels as though it has been untouched by modern day life. Founded in the 17th century, the colonial village is steeped in a charming, rich, and quaint history of ship building that is reflected in the historic Mystic Seaport Museum. A former shipyard, this major attraction is now an educational center that helps visitors understand the origins and development of the ship building industry in this coastal town. Explore this museum, learn about the history of the whaling industry, and how this business transformed this town into one of the biggest shipyards on the East Coast. Here, historic colonial, New England homes dot the landscape and transport you back in time as you walk along the rocky shore and see the enormous masts of archaic clipper ships, gunboats, and naval vessels bob up and down in the water. But if history is not your cup of tea, Mystic also has a fantastic aquarium, as well as a charming city center where you can ride your bike, indulge in some home made ice cream, devour some authentic New England clam chowder, and try to find some hidden treasures in one of the town’s many antique shops. A relaxing and replenishing weekend getaway from anyone who is looking to escape the chaotic frenzy of life in a major city. Finally, we’re at the end of our East Coast vacation tour, in Boston! Picture: Postcards From Ivi. Written by Ivana, who has a fantastic 3 day itinerary to Boston here. You can also follow her on Instagram. Boston is one of the most picturesque and beautiful cities in the U.S. This city is the capital of the state of Massachusetts and one of the oldest and historic cities in the United States which makes it perfect for a cultural immersion trip. Several battles and events that led to the independence of the United States occurred in Boston. One of the activities to do in Boston is to walk the Freedom Trail, a 2.5-mile-long route that passes by 16 significant locations where historic events took place. The trail is marked by bricks on the floor that lead to the different sites. It is a very entertaining walk, full of history and interesting buildings. architecture: cobbled streets, lanterns, Victorian buildings, the British vibes are everywhere. Acorn Street is one of the most famous and photographed streets that makes you travel back in time. Outside Boston you’ll find the city of Cambridge where Harvard University and MIT are located. 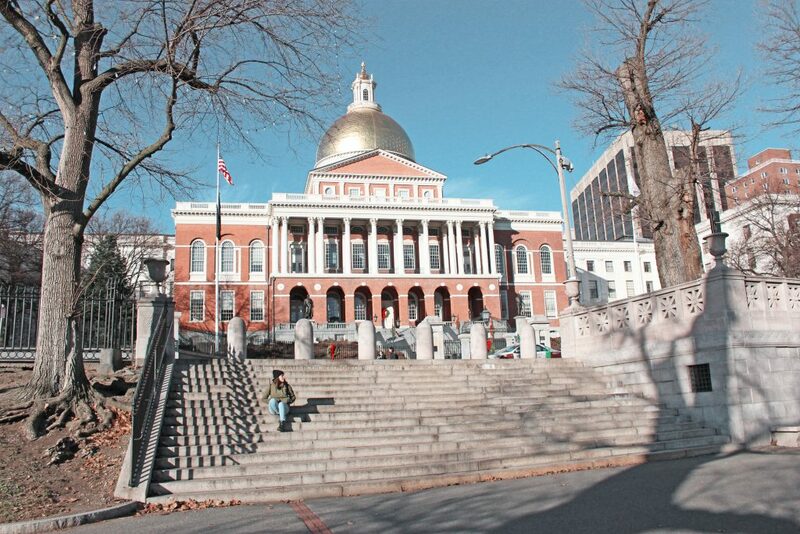 You can easily get there from downtown Boston and spend a day visiting the famous universities. Boston is definitely one of the best places to visit in the East Coast where you can easily spend three or four days as there’s so much to see and do. The Adirondacks are on my list and now so is Alexandria! I’m a sucker for a historical city! I’ve only been to New York and Miami, I really need to broaden my east coast horizons! I have always wanted to go to Boston though, it’s way up there on my travel bucket list! You’re better than me, I’ve only been to New York for a couple of days. I want to explore the East Coast so much! I’ve only been to Miami and New York (repeatedly). My list has just expanded. Thanks for the inspiration! Well if you’re going to pick two places, you’re almost guaranteed to have an excellent time in New York and Miami. These are all great suggestions! I’m looking to hit up some of these spots next fall when I’m embarking on an East Coast road trip. I’m especially excited to explore the Outer Banks! Wow, you really plan ahead, good on you! Have a great road trip and I hope this post has helped a little. A pleasure to read, I learned about so many less known places! As a European I am not very educated on the geography of smaller towns in the States, but I’m always interested to learn more. On my first trip to the States I was actually lucky to stay in and explore Cape Town, and I really got to love the area. It was totally new to me, and such a pearl to discover! 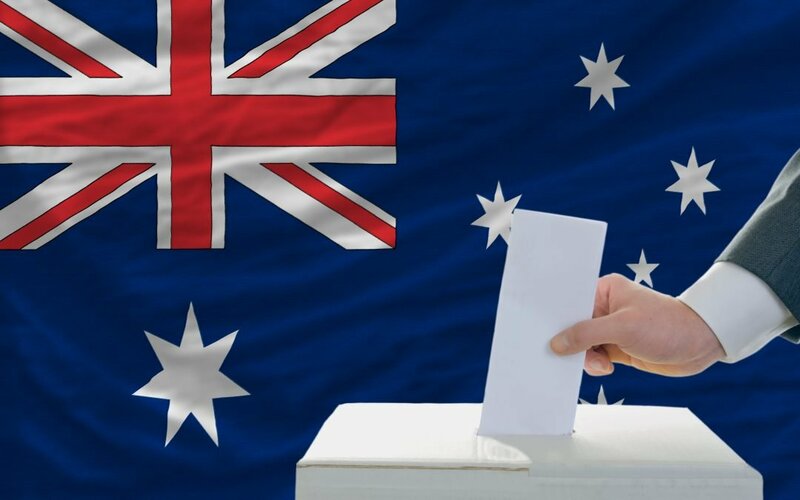 As an Australian, I’m in the same boat as you Eva. People talk to me about places and I have to secretly Google them later so I know where they’re talking about. Have a fantastic time in Miami and I hope the restaurant recommendations are on par. I have been to many of the mentioned destinations but never to Mystic. As I have ultimately discovered that I love exploring sleepy destinations, this seaside village in Connecticut seems to be a peaceful place to travel to. I guess that means you’re going to have to tick Mystic off the list then! Such a diversity of places to explore. I don’t know this region at all, and never visited, but I love the vast openness of your Adirondack Mountains photo – that would be my first choice. Isn’t it just gorgeous? I’ve wanted to visit the Adirondacks for years! This is such a fun post! And I’ve actually been to quite a few of them 🙂 I am particularly partial to Cape Cod though as I spent a year living there growing up! I’ve heard so much about it, it’s a shame that the east coast is such a long flight from the west, it’s hardly worth flying over for the weekend. I know Clare! It’s a shame they’re all so far away from me, I’d love to be able to just head over for a weekend at a time. I’ve only been to New York out of all of these cool places! My family’s favorite East Coast spots are New York City and Charleston, South Carolina. I have extended family in both places. But I’d love to explore more of the East Coast, in the northern parts like Massachusetts and Maryland. Oooh I’ve never been to Charleston. Just the name makes me think of old world charm and southern hospitality. Can’t wait to visit one day! Thanks for the lovely suggestions. I’m from the Pacific Northwest and haven’t had much of an opportunity to explore the east coast. I’ve always wanted to travel east and now I have some great ideas to inspire me. I know what you mean, I’m in the pacific northwest as well, and my East Coast travel list is not getting any shorter! So many wonderful suggestions! I’m from a more Eastern part of Canada, and I find the East Coast doesn’t get as much interest as the West for travel destinations! I’m going to add some of these to an East Coast road trip! Really? That’s interesting. Maybe because it’s sometimes warmer on the west coast? Having said that, I went to Toronto in February this year and loved it! Squeee! You have so many good ideas for future holidays! To be honest, all the places I have planned to explore in the US are natural spots, like natural parks. This post has made me want to visit some of the East Coast cities too. Watkins Glen looks soooo lovely! Out of these, I fancy vising that most! Yeah I grew up on a farm in the suburbs, so I do like wide open spaces, but then I also love cities so my travel is usually a mixture of the two. I think that New England would be a perfect girls trip Scarlett! Thank you for this, I wanted some new options and some other opinions before I book to head that way. This was so helpful. Cape Cod and Newport are on my list!! I love, love, love Boston and NYC. It’s funny because I used to believe that you were either a Boston person or an NYC person… but I found ways to be both! 😉 I was in Pittsburgh in September and I enjoyed it so much more than I thought I would – I love your photo of the skyline and the photo of Mystic is gorgeous! Hey, I live in Alexandria, Virginia 🙂 Recently moved two years ago and have been eager to explore more of the East Coast. I have only been able to go to New York City and Pittsburg from your list. Looks like I have plenty of options of places to visit. So many awesome suggestions for places I haven’t been to! Can’t wait to get back to the USA and see some of these next time. Great list. Seems I have plenty of choices for my next time in the US. Cape Cod is pretty high on my bucket. 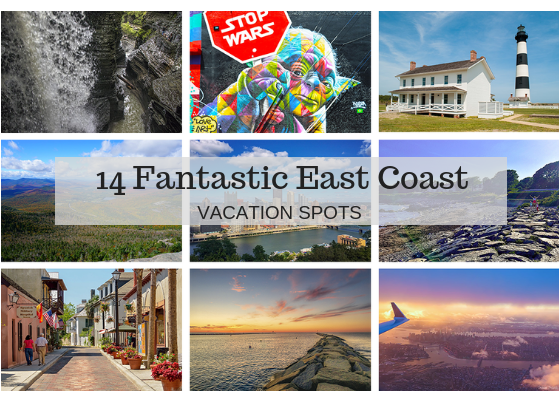 Wow – tonnes of travel inspiration for the Eastern States! I’ve visited Miami, NYC and Watkins Glen out of all of these and would love to add Boston, Newport and Pittsburgh to my ever increasing list of places to visit sooner rather than later! Have bookmarked to return to at a later date!